A parliamentary report of 1777 recorded parish workhouses in operation at Melksham (for up to 70 inmates) and Hilperton (10 inmates). County of Wiltshire: Hilperton (2), Melksham (6), Seend (2), Semington, Staverton, Trowbridge (8), Whaddon. The population falling within the Union at the 1831 census had been 18,252 — with parishes ranging in size from Whaddon (population 58) to Trowbridge (10,863). The average annual poor-rate expenditure for the period 1831-4 had been £10,566 or 11s.7d. per head of the population. 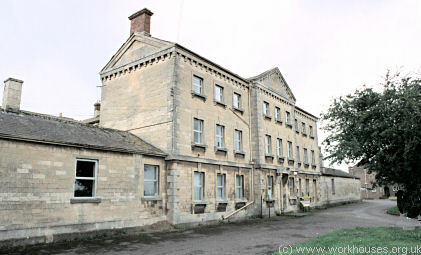 Erected in 1838 to designs by HE Kendall, the Melksham Union workhouse at Semington was based on the Poor Law Commissioners's standard cruciform plan. The site layout is shown on the 1924 map below and the aerial picture taken in the 1970s. Melksham aerial view from the north-east, 1970s. The workhouse entrance range was placed at the north of the site. At its centre were the Guardians' board room and adjacent waiting room and clerk's room. To the left were the boys' school room and a coal store, while to the right were the porter's lodge, girls' school room, and a stable. Melksham entrance range from the north-east, 2000. 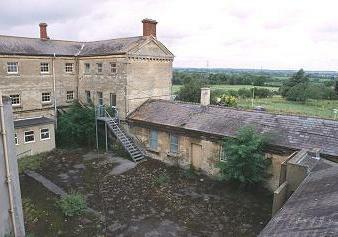 Melksham from the north-west with original stable at centre and coach house to its right, 2000. To the rear, were boys' and girls' yards with scullery, surgery and stores in between. 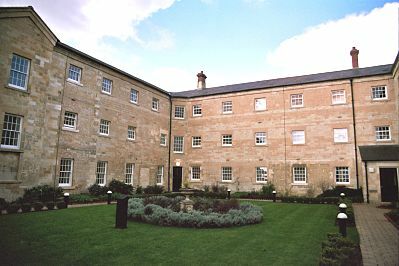 Melksham rear of entrance block and boys' yard from the south-east, 2000. 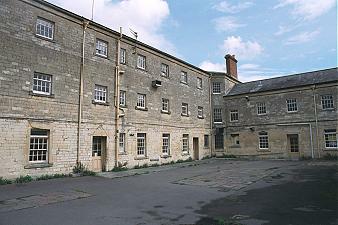 Melksham boys' yard from the east, 2004. 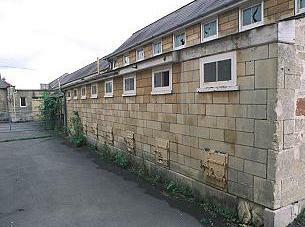 Melksham rear of entrance block and girls' yard from the west, 2004. Male and female accommodation ranges radiated to the east and west from the central octagonal hub, which contained the kitchens at its base, with the Master's accommodation above. The southern range at the rear contained the workhouse dining-hall on its ground floor. 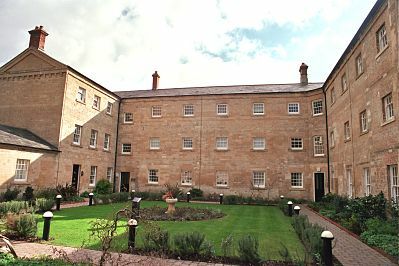 Melksham women's yard from the south-west, 2000. 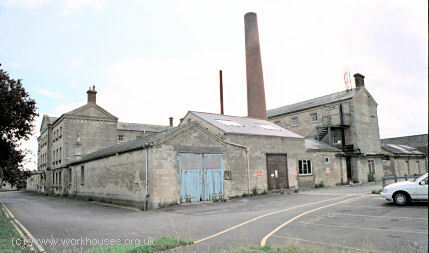 Melksham men's yard from the south-east, 2000. To the east of the main building is a casuals' block. Casuals (vagrants) were required to perform a certain amount of stone-breaking in return for their night's lodging. Each cell consisted of a sleeping room leading through to a work room. The stone-breaking bench in the work room had a chute leading to a small metal door covering an outlet for the small pieces of stone produced by this work. The stone would have been collected and sold for road-making. 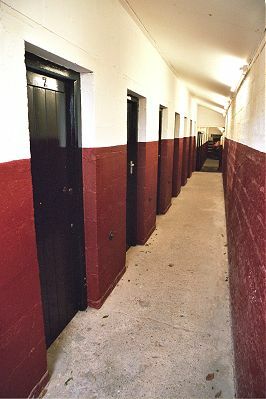 These cells are said to have stayed in use up until 1947. Melksham casuals' block interior, 2000. To the north-east of the workhouse was a mortuary and small chapel. 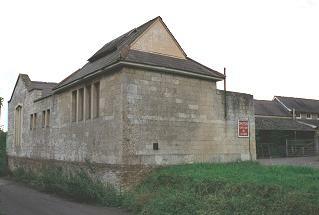 Melksham mortuary and chapel, 2000. An separate infirmary block was erected at the west of the site. Melksham Union was renamed Trowbridge and Melksham in 1898. 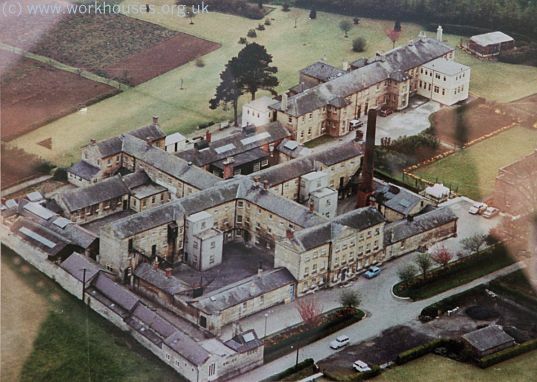 In 1930, the workhouse became Trowbridge Public Assistance Institution, then from 1948 until 1988 as St George's Hospital it provided care for the elderly infirm and those with a mental handicap. The site was redeveloped for housing in 2002-3. As a young child I was the constant companion of my Great Aunt Kate who was like the grandmother that I had never known. Aunt Kate was an active member of our Congregational Church and very involved in the local community, even though she was in her seventies. One of her regular activities was to visit local women who had been admitted to the nearest Workhouse at Semington in Wiltshire, a bleak gaunt looking building. Inside the building it was divided, one side for men and the other for women, even married couples were segregated though I believe that in some institutions husband and wife were allowed to meet briefly on Sundays! There was a ritual to the visits in which I was happy to take part. Firstly I was sent to the local shop to buy sweets, about six different varieties, and some white conical paper sweet bags. The boiled sweets were then divided between the bags - about 15 - and a twist made at the top to keep them secure, before being packed into a wicker basket. On arrival we went straight to the women's ward which was a rather sad place. The women sat on wooden Windsor-style armchairs placed at the end of their beds. Some were senile and sat starring into space, some muttering to themselves their hands constantly moving. For them to see a golden haired child was an event especially when she had a basked of sweets! Some women were quite scary to a four-year-old and to those I approached from the side, quickly placing the sweets on their laps and moving on. Others would have a little chat and pat me on the head, then I sat with Aunt Kate while she chatted to the friends she knew. Although I enjoyed those outings with my Aunt, my abiding memory is of people, not all of them elderly, almost abandoned by society to rather stark institutions where their physical needs were just met but there was no mental stimulation. The Trowbridge and Melksham Union established two children's homes. 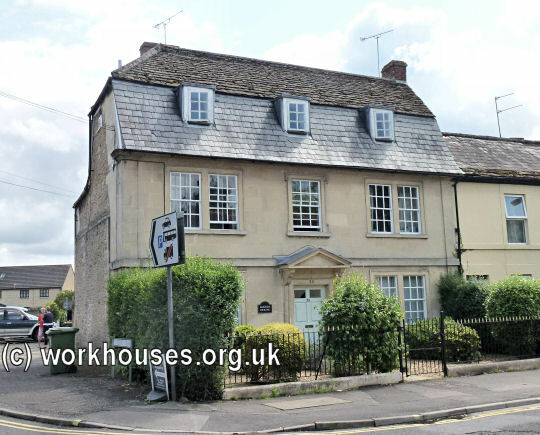 A girls' home was located at Honeywell House, 39 King Street, Melksham. In 1924, it could accommodate 15 girls, with Miss Harding as Superintendent. 39 King Street, Melksham, 2014. 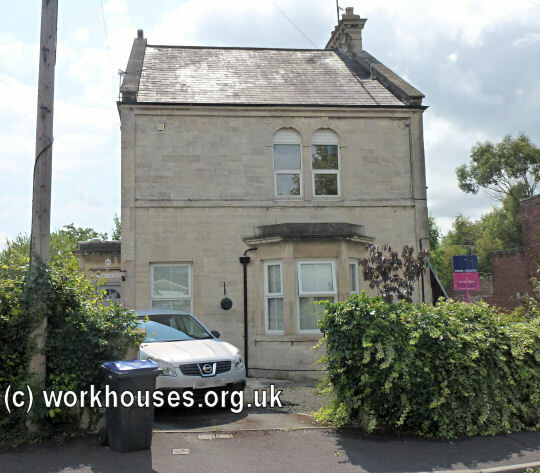 A home for boys was at Fern Cottage, 98 Ashton Street, Trowbridge. In 1924, it could house up to 15 boys, with Miss Price in charge. 98 Ashton Street, Trowbridge, 2014. Wiltshire and Swindon Archives, Wiltshire and Swindon History Centre, Cocklebury Road, Chippenham SN15 3QN. Very few records survive — holdings include: Guardians' minutes (1835-1930); Births (1878-1931); Deaths (1878-1949); Punishment book (1915-43); Admissions and discharges (1911-44); Inmates property register (1914-54); etc. In and Out of the Workhouse by P Blake (in Wiltshire FHS . 44, 1992).